With Thanksgiving almost here, it’s easy to get wrapped up in holiday preparations. But you can’t forget about the needs of your business. In the spirit of Thanksgiving, we’ve prepared an infographic: The Recipe for the Perfect CRM System. Sales and customer service teams spend most of their time on the phone and in their CRM. But too many times these systems are not connected, leading to wasted time and frustration. 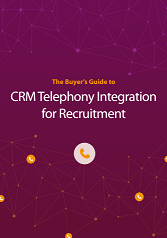 And while you may know that closing the gap between those two systems will improve the quality and quantity of work from your employees, it’s hard to know where to begin when looking for a telephony CRM integration vendor. First, it’s important to consider what features are most important to you. Are you looking for click-to-dial, allowing you to make calls directly from your CRM? Would call recording help you with training and compliance? Do you need call analytics to gain more insight into the activities of your team? For years, us salespeople have been tied to a little piece of plastic at our desks. Using physical phones have forced them to stay in noisy offices struggling to hear or have made it harder for them to work from home or on a business trip. The increased use of headsets and the prevalence of smartphones has made this somewhat better. However, many times you may not want to use your personal mobile phone for work or poor service prevents this from truly providing the mobility benefits. What about using softphones? A softphone, or a software telephone, is a application that allows you to make calls from your computer. While the choice between a softphone and a hardphone is truly one of personal preference (I know some of my colleagues still love their plastic desk phones), for me, the softphone wins out every time. Bad Data: Don’t Let It Stand in the Way of a Good Deal! According to an IBM infographic I recently viewed, 23% of an organization’s data is bad data (incomplete, out of date or inaccurate). When I first read this statistic, I was shocked. But that shock quickly turned to sadness when I realized that I’m sure it’s true, and I wasn’t quite sure what to do about it. As a marketing manager, I spend much of my day strategizing how to bring in new leads, make customers happy and engage with prospects. And I know my sales team is spending their day a little further down the funnel trying to do the exact same thing. But our best efforts (or 23% of them) are being thwarted by inaccurate, unorganized or mishandled data. So how does bad data affect our workflow? More importantly, how are we trying to fix it?